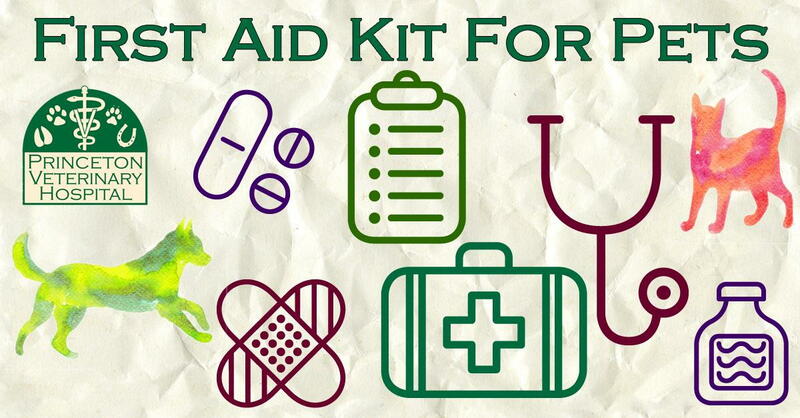 Just like you keep a first aid kit handy for your family, you should also keep a first aid kit handy for your pets! A lot of the things that we can use for basic first aid in our pets are the same that we use for our families, but there are a few differences, and things that you’ll want to keep separate. Many accidents or injuries will require veterinary attention, but keeping a stocked first aid kit handy can be a big help. Here are some things you should keep in your pet’s first aid kit. Gauze rolls and pads To control bleeding. Rolled gauze can also be used to make a temporary muzzle for scared or injured pets. Hydrogen peroxide For cleaning wounds and removing blood from fur. Can also be used to induce vomiting. Always call your veterinarian before trying to make your pet vomit. Milk of magnesia To treat for poison. Always call your veterinarian before treating an animal for possible poisoning. Benadryl (or generic diphenhydramine) To treat allergic reactions. Always call your veterinarian before treating an animal for an allergic reaction. Doses for animals are different than doses for people. Imodium (or generic loperamide) To treat diarrhea. Always call your veterinarian before treating an animal for diarrhea. Doses for animals are different than doses for people. Pepto-Bismol (or generic bismuth subsalicylate) To treat vomiting. Always call your veterinarian before treating an animal for diarrhea. Doses for animals are different than doses for people. **Never give your pet Tylenol (acetaminophen), Advil (ibuprofen), or Aleve (naproxen). These can be poisonous to pets. To treat pain or fever. Always call your veterinarian before treating an animal for pain or fever. Doses for animals are different than doses for people. Keep your first aid kit together, in a sturdy container, in a location that will be easy to find in an emergency. It’s a good idea to pack this kit with you anytime you travel with your pets, just in case of an emergency. We recommend that you keep a few medications handy in your pet’s first aid kit. It is still essential that you call us (or your regular veterinarian) before administering any medications to your pet, even “just” aspirin. The amount of medication that an animal needs is different from what people need. While these medications may be helpful in some cases, there are other times when giving these medications may be inappropriate, and only your veterinarian can make that decision. And not all medications for people can be given to animals. For example, Tylenol or Advil are poisonous to pets, but it is common for people to take these medications. Never give a medication to your pet without your veterinarian’s advice! If your pet is injured, please call us (or your regular veterinarian) right away. We may be able to recommend some basic first aid that you can do at home before you bring your pet into the hospital. First aid can be very helpful in preventing further injury, but is not a replacement for veterinary care. Remember, we are available for emergencies after our regular office hours! Call our regular number, (812) 385-2733, and follow the prompts on our answering service for an emergency.